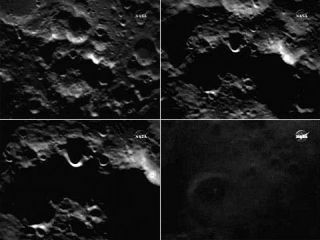 This set of NASA images, taken Oct. 9, 2009 by the LCROSS shepherding spacecraft, shows the Cabeus crater (center of images with smaller crater on rim) just after a Centaur rocket stage was due to crash into the moon at 7:31 a.m. EDT in a hunt for water ice. Starting from top left and moving clockwise in these images, the LCROSS probe draws ever closer to its own impact after the first hit. NEW YORK - Some observers hoping for a big blast from NASA'smoon-slam experiment Friday were a bit disappointed. Though NASA officials say they're thrilled with the impactof the LCROSS probe into the moon, some scientists and members of thepublic were left wondering why there was no obvious debris plume after thecrash. "I don't know about you, but I didn't seeanything," said Columbia University astronomer Arlin Crotts, who waswatching the impact on NASA TV with a group of scientists and students gatheredat a "viewing party" for the event. "I wanted anexplosion," a Columbia graduate student said. Instead the screen showed footagefrom the spacecraft as it moved closer and closer to the lunar surface.Then, suddenly, the screen went white. When footage came back, it showed themoon seemingly unperturbed. Some SPACE.com readers also expressed disappointment. "This was anti-climactic at best - there was absolutelyno visibleclue of any impact," wrote commenter HanShotFirst. "Maybe they should change the headline from 'KAPOW!' to'bloop' - I saw no evidence of an impact at all," wrote user gahmuret. But NASA scientists stressed that just because thepreliminary footage didn't show an obvious debris cloud, that doesn't meanthere wasn't one. The goal of LCROSS's crash was to kick up material from thelunar surface and analyze the signature for signsof water or other interesting chemicals present in the moon dirt. NASA predictedthe probes would create a plume of material 6.2 miles (10 km) high. "I'm not convinced we haven?t seen the ejecta,"said LCROSS principal investigator Tony Colaprete during a post-crash pressconference. "I want to go back to those images and look at them carefully.You just never know how these things are going to go." Colaprete explained that the footage broadcast on televisionwasn't as high resolution as the direct data available from the orbiting LunarReconnaissance Orbiter (LRO), which launched in June alongside the the LCROSSshepherd spacecraft and its separate impactor probe. Plus, he added, the maindata scientists are interested in are not the visual images, but the spectra,which are taken with an instrument that separates light into its constituentwavelengths. "I saw variations in the spectra," Colaprete said. "I'm thrilled, that's a very good sign. The spectra is where the scienceis." NASA officials said they were elated by the results so far. "It's been an exciting period," said NASAadministrator Charlie Bolden, who called LCROSS "the third big event"to occur since he took on NASA's top post in July. The first two momentousoccasions were the Apollo 11 40th anniversary and the recent rejuvenation ofthe Hubble Space Telescope. The LCROSS mission was recently dedicated to the late journalistWalter Cronkite, who reported on many great events in space history, includingthe first U.S. moon landing. Cronkite's son Chip was on hand with reporters andNASA officials watching the LCROSS impact at Washington, D.C.'s Newseum Fridaymorning. Cronkite called the event "fantastic" and said he hopedthe results reveal water ice on the moon. He said his father "would lovedto have been able to cover all these next missions," including possiblefuture human trips to the moon. SPACE.com senior writer Andrea Thompson contributed tothis report from Washington, D.C.
Video - Why Bomb the Moon?